Welcome to the Blog Hop for May 2017. This month our theme is “Sneak Peek”. 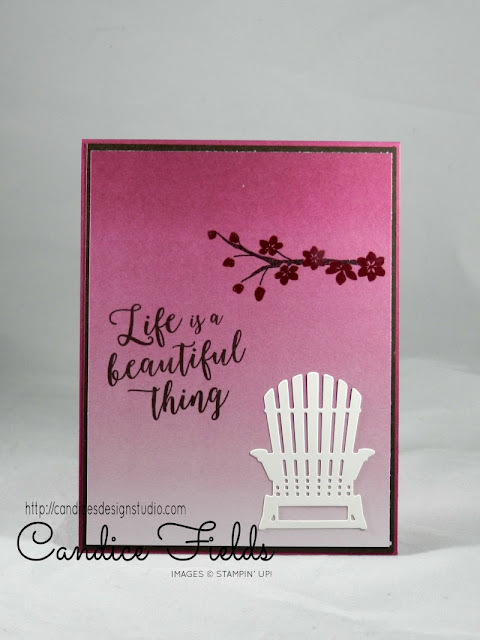 You may just be starting the blog hop here at my blog – Candice's Design Studio or may have come from the person previous to me in the list. If you get off track at any time, the full lineup below will help you move along from blog to blog so you see all the projects. At the moment you are visiting Candice Fields. For my project, I am doing a sneak peek of the Colorful Seasons bundle. This bundle is perfect of creating all year around. Wow! This one is absolutely beautiful Candice! I love the background, the sentiment is perfect for any occasion and the overall clean and simple design really makes a big statement. So very pretty! Great way to use the Designer Paper. Beautiful card Candice! The Berry Burst makes an amazing punch with this card. This is beautiful!. It makes me want to go sit in the backyard!